BMW has announced a very rare 2013 M3 DTM Champion Edition model will be produced in honor of BMW Motorsport returning to the DTM and winning. When BMW returned to the DTM this year after 20 years, their expectations were exceeded when Canadian driver Bruno Spengler won the drivers’ title with the BMW M3 DTM racecar. The race series is a Silhouette racing series based in Germany, with other rounds in Europe. BMW Team Schnitzer finished in the top spot in the team standings, and BMW claimed the manufacturers’ honors. So how does BMW celebrate the success? By building a rare 2013 BMW M3 DTM Champion Edition model that will only see 54 examples produced. BMW M GmbH unveiled the 2013 BMW M3 DTM Champion Edition that is supposed to look like the BMW M3 DTM race car that follows in the footsteps of the legendary first-generation M3. The special edition model will be available exclusively in Frozen Black metallic, with carbon flaps and gurney, dark chrome elements, and matt black wheels. The exterior theme continues with the BMW M stripe design over the CFRP roof and boot lid, BMW M logo to the rear of the front wheel arches and decals in the rear side windows. The DTM treatments continue inside the cabin of the 2013 M3 with door sill strips designed to replicate Spengler’s helmet design and the carbon-fibre interior trim strip bears the drivers signature and the car’s serial number. The cabin also features like an Alcantara steering wheel, handbrake lever embroidered with “M Power” lettering, and extended black Novillo leather trim with features in contrasting Palladium Silver. 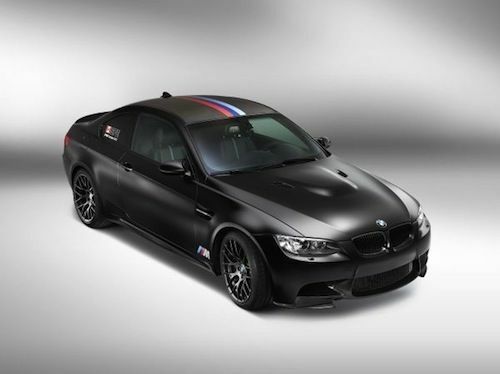 The 2013 BMW M3 special edition will be based on pure performance and will feature the Competition package, M Drive, M DCT Drivelogic and the M Driver’s Package. Comfort features will go with the high-performance with heated seats, navigation and Park Distance Control. BMW hasn’t announced what will be under the hood, but we assume it will be the standard 4.0-liter V8 that pumps out 414 horsepower and 295 lb ft of torque. The powerful V8 will come mated to a six-speed manual gearbox. The 2013 M3 will launch from 0-60 in 4.7 seconds with an electronically limited top speed of 155 mph. Only 54 examples of the 2013 M3 special edition will make it to production. Don’t look for the new 2013 M3 DTM Champion Edition to make it to U.S. shores, as it will be sold in Germany and limited international markets. But those special few owners will get the chance to attend the BMW M Fascination Nordschleife driver training course under the watchful eye of driver Bruno Spengler. The course will be held on the Nürburgring’s legendary Nordschleife track, where BMW puts the M3 cars through extreme testing sessions and where final chassis tuning is carried out. The super rare 2013 BMW M3 DTM Champion Edition will be built at BMW’s Regensburg plant and the BMW M GmbH factory starting in February 2013. Prices in Germany start from $127,967 U.S.